October 8 2017. 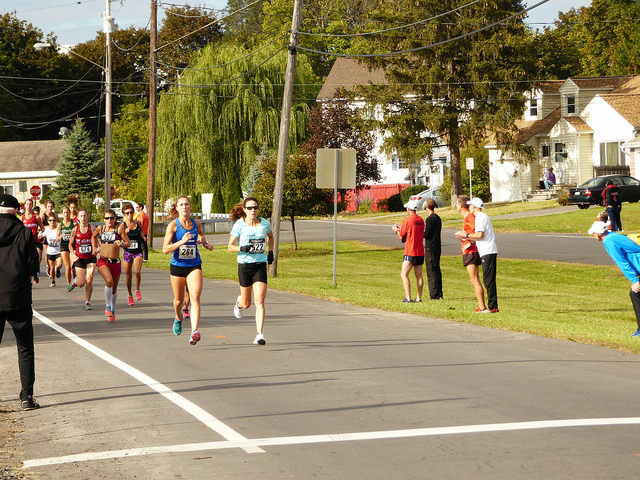 A perfect running day waltzed into the Finger Lakes district of New York for Dave Oja's final Syracuse Festival of Races outing on October 1st. 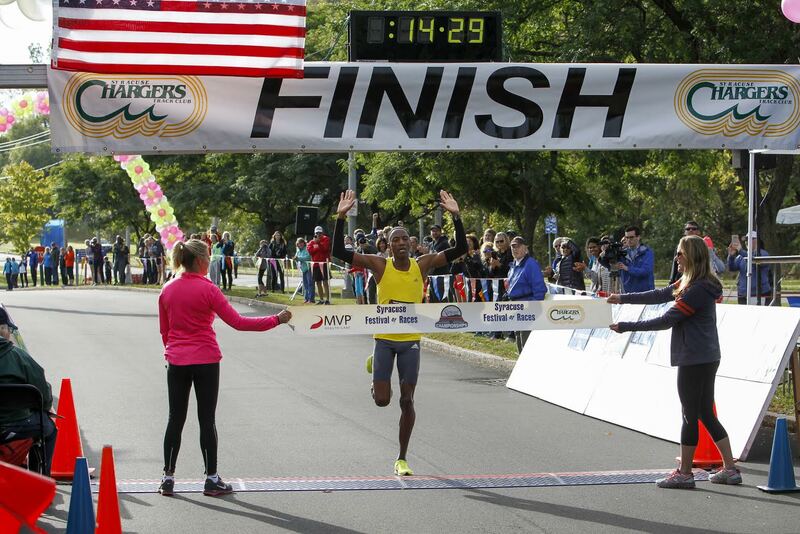 A record number of Masters Athletes, 282, had registered for the USATF 5K Masters Championships. But only a handful of those had realistic hopes of competing for Age-Grading and Overall Championships. Prize money for Age-Grading, symbolic of excellence across all age groups, goes 5 deep; prize money for the Overall Masters Championship goes three deep. Medals go 3-deep for both. Who would compete for those spots? Women: Susan 'Lynn' Cooke, Honor Fetherston, Tania Fischer, Jeanette Groesz, Sabra Harvey (2), Susan Hay, Jan Holmquist, Doreen McCoubrie (2), Jeannie Rice, Edie Stevenson(2), Marisa Sutera Strange (2). Those entered in the 5K from that list, who were fit and present for the race, included Bernhard, 66; Blaich, 51; Castille, 45; and Larson, 55 for the Men's Race and Cooke, 58; Harvey, 68; Holmquist,73; Stevenson, 68; and Strange, 54. Five of the six who comprise the podiums would come from this list. 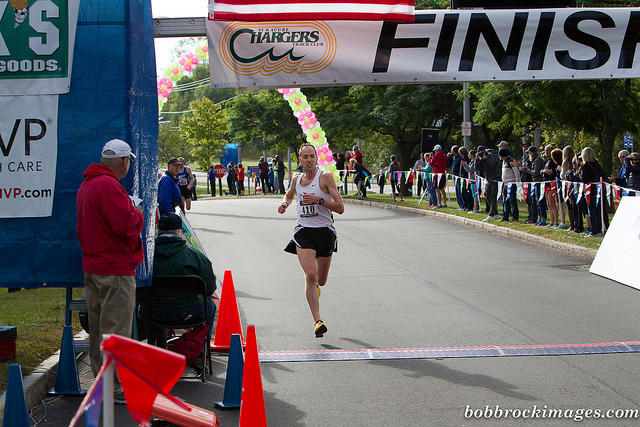 Others who might contend include: Carl Combs,52, who finished 5th in Age-Grading at this race last year; Roy Englert, 95, who would be aiming for an American Record and World's Best 5K time for the 95-99 age group; and Nora Cary, 62, and Trish Butler, 54, who finished 6th and 8th in Age-Grading last year. In the event, it was hardly a contest on the Men's side as the Lafayette, Louisiana speedster, Castille added another top-3 age-grade finish to his total, with a sterling 98.12% off his 14:29. Three percentage points back at 95.25 was the pride of the Bay State, Larson, notching his 4th age-grading podium finish this year off of his 16:06. Larson edged our new nonagenarian record holder, Englert, by .13 percentage points, who got his record with a 40:40 chip time, but whose 40:52 gun time (used for age grading in this event by USATF Rules) landed him 3rd in age-grading. Rounding out the men's age-grading prize winners were Combs and Bernhard at 94.41 and 93.58. Kent Lemme, Larson's teammate finished 6th with Blaich in 7th at 92.59 and 92.33. It was a little closer in the Women's age-grading. At distances up through 10K, Harvey is almost unstoppable, recording her 3rd win of the series with a 99.07% off of a 20:44. Holmquist was less than a point back in notching her 2nd top-3 finish with 98.13 from her 22:27, with Stevenson 3 points back at 95.24 off of a 21:34. Sutera Strange and Cary also went home with some prize money, finishing with 93.8% off of 18:25 and 92.46% off of 20:33. Just missing was Hall of Famer, Carmen Ayala-Troncoso, 58, the only other woman in the race to crack 90% at 91.47% from a 19:47. Overall Championship. 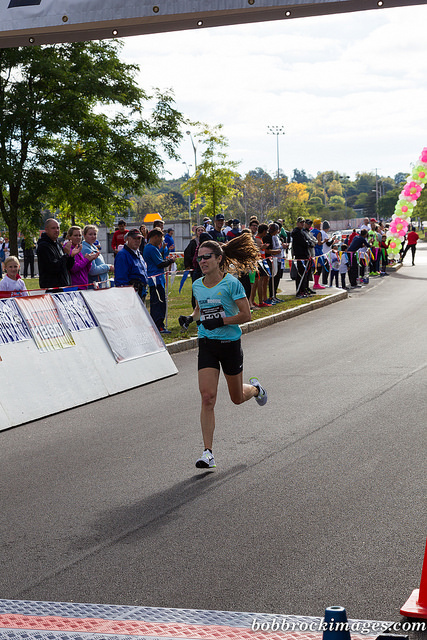 Except for the Road Mile event, this race is the shortest on the road portion of our circuit and draws some of the speediest track and road runners across the country. Last year Janet McDevitt came from Club Northwest in the state of Washington to contest the event against the Atlanta Track Club's Sonja Friend-Uhl of Florida and local runner, Sascha Scott. Last year it was McDevitt, Scott, and Friend-Uhl in that order. McDevitt could not make it this year and Friend-Uhl was too busy with her Cross Country charges, her other enterprises, and family. Scott was determined to move up a notch and was fully prepared to run as fast or faster this year. She ran the JP Morgan Corporate Challenge 3.5 miles in 20:31, almost a minute faster this year than last and finished the Musselman Half Iron Triathlon with her fastest time in the last three years, breaking 1:20:00. But there are no 'gimmies' in this competitive Masters circuit. Christy Peterson, who finished 9th last year, over half a minute behind Scott, had been burning up the roads the last 5 months, gaining the Masters podium in prestigious events from the Blue Cross Broad Street Run (10 Miles in 1:03:40) to the Bjorklund Half Marathon (1:24:21) at Grandma's in June, Peachtree (37:28) and Falmouth, and then dropping down to the NY Fifth Avenue Mile (5:04) . With a season like that, we knew that Peterson would not just be a bystander. 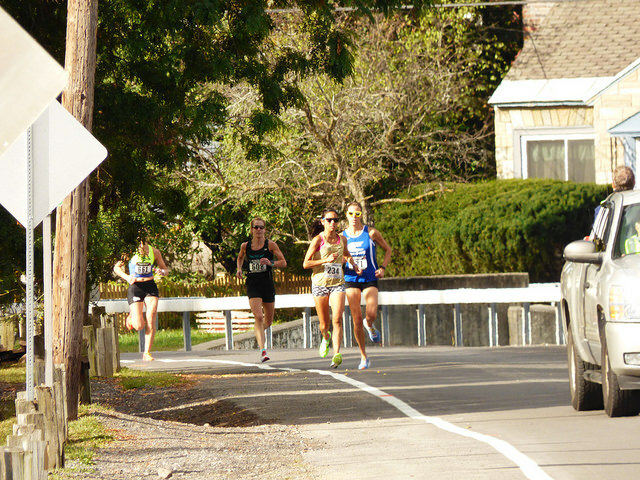 Renee Tolan skipped the race last year after finishing 3rd in 2015 in 18:03. She brought with her a sterling record at Road Miles over the last two months. 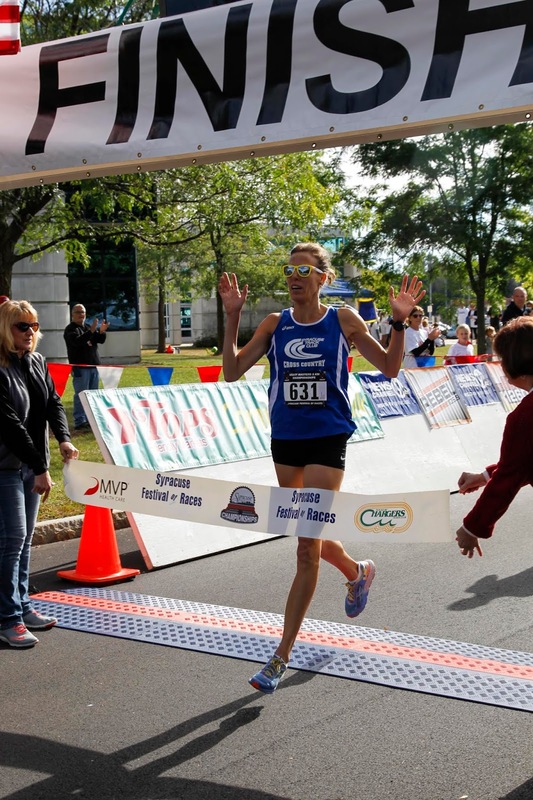 She took first Masters at the Liberty Mile at Pittsburgh (5:25) and then won the USATF Road Mile Championship at the challenging course at the Crim Festival of Races' Michigan Mile in late August in 5:29. Cassandra Henkiel of Team Rogue, from Austin Texas, finished just ahead of Peterson last year and just behind Tolan the year before.Perhaps third time would be the charm. Marisa Sutera Strange, who finished 4th last year in 17:54, was coming in with uncertain fitness; she had withdrawn from the USATF Road Mile Championship in Flint due to a hamstring issue. 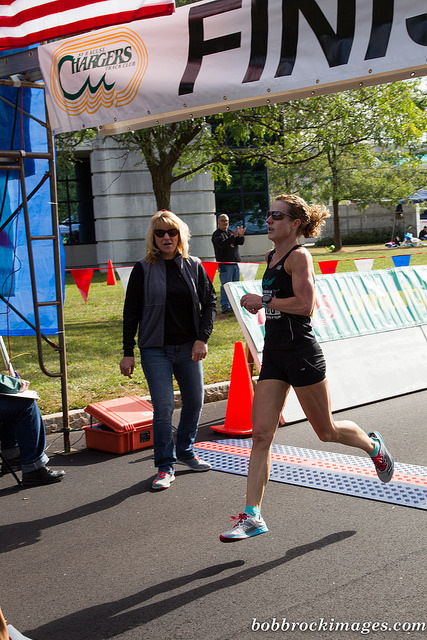 Earlier in the year, Strange was close to the top of her game, finishing on the podium in both the 8K and 10K Masters National Championships. Coming off a hamstring rehab is not the ideal preparation for a Championship; it would take a terrific recovery for her to make the podium in this race. Suzanne Larsen, of Patient Endurance out of Michigan, is a newly minted Masters Runner, aging up in September. She had run a fast 17:45 5K in April but her efforts over the summer were generally in the 18:04 to 18:27 range. She finished 8th overall in the Clawson Firecracker Mile in 5:29. Larsen certainly has speed enough to make it interesting. When the gun sounded, Scott moved off, feeling she had the conditioning to run a 5:40 pace. Her goal was to run with race leaders, whether Masters or Open. As a result she opened up a lead over the other contenders. But Peterson would not let her build up her lead. Tolan was trying to close on Peterson but her best efforts left her a few yards back throughout the first half of the race. Scott hit the halfway mark in 8:44, consistent with her plans; Peterson was 5 seconds back, well within striking distance. Tolan was finding the pace a bit much and had fallen 7 seconds back from Peterson. Henkiel had moved up steadily after the first mile and was now only 3 seconds back from Tolan. Larsen and Strange were next in line, 5 and 9 seconds respectively back from Henkiel. It appeared that Strange had lost some fitness to the hamstring issue; she had covered the first half of the race nearly 20 seconds faster in 2016. After the race, Scott noted that the pace had been a little too fast, that she was hanging on for the last mile and "the wheels started to come off" with about 500 meters to go. Scott could hear Peterson closing and coming on strong. 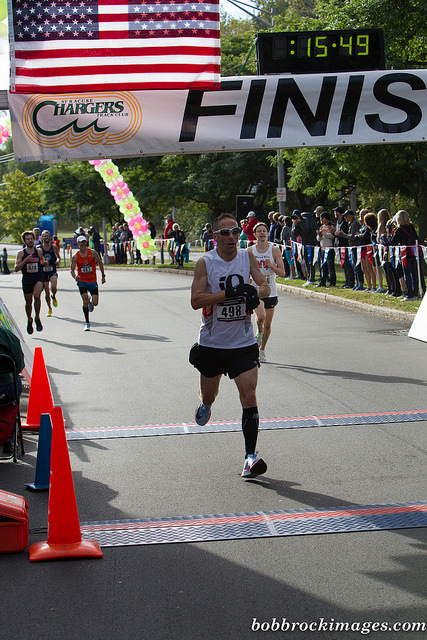 Somehow Scott hung on and, in the end, had the victory in 17:50 by a single second. Once Henkiel passed Tolin shortly after the halfway mark, she was able to impose a gap as Tolan was clearly having an off day. Henkiel brought it home strong, finishing in 3rd in 18:09. Eight seconds back, Tolan was finishing off a gutsy performance, holding off the fast closing Larsen, to claim 4th by a single second--some competition! Strange was 7 seconds back in 7th. Kevin Castille was the odds-on favorite in the men's race. The defending champion, he won here with a 14:46 and almost a half minute margin. He appears to be running even stronger this year as he has put his injury problems behind him. Earlier this year he took Masters titles at prestigious races such as the Bjorklund Half Marathon at Grandma's and the New Balance Falmouth Run. 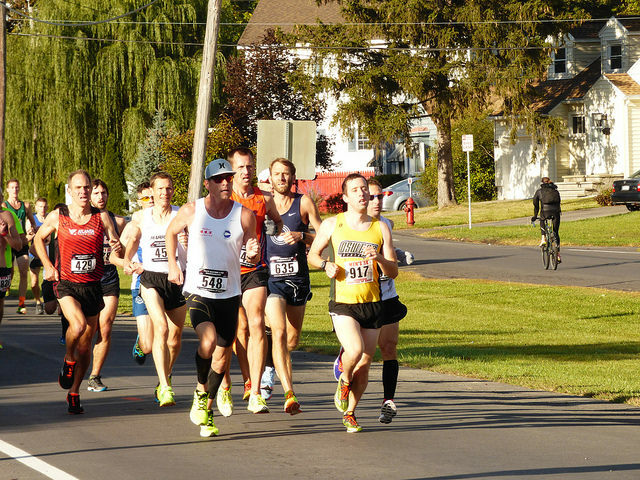 In the second half of the year he set a new American 15K record for Men 45-49 at the Utica Boilermaker in 46:10 and a new 10 Mile Record in the same division at the Crim Festival of Races in 49:03. Both records had been held by the legendary Bill Rodgers for over 20 years. 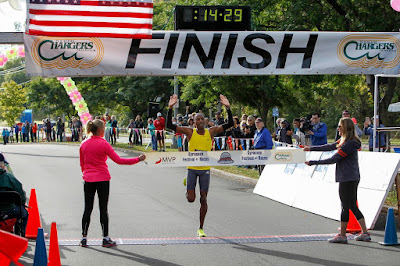 And he has shown speed too, winning the National Masters Road Championship at the Crim Festival in 4:24 and running a sub-30 minute 10K at the Great Cow Harbor Run. 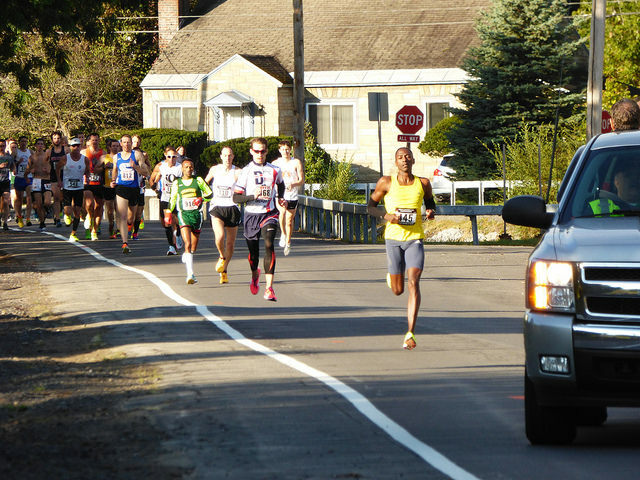 Last year John Gardiner and David Angell battled stride for stride until Gardiner was able to pull away in th elast kilometer and claim 2nd in 15:12, seven seconds ahead of Angell. But this year, Gardiner is not entered. That would seem to give Angell the edge for the silver medal. Who would be the main contenders for the Bronze medal? Initially I thought it would be Christopher Shaw, Jr. and Kristian Blaich, who finished 6th and 7th last year. And, to be frank, did not even give a shout out to Jonathan Frieder who finished 17th last year in 16:05 and 13th in our 10K Championships at the end of April. But when I was checking the CVS Downtown 5K results to verify Nat Larson's American Record, it was clear that Frieder's training had enabled him to turn a corner. I should also have looked back to the 2015 Masters National 12K Championship in Alexandria VA, where Frieder finished 4th overall. I viewed Greg Putnam, who finished 9th last year and 6th at the 10K Championships as having an outside shot at the podium. Frieder beat Putnam in that race by 16 seconds! And then Carl Combs was a late entry who finished 9th last year. A consistently strong runner, Combs had a podium shot as well. The Men's race for 1st place turned out to be as close to a 'gimmie' as it gets. Kevin Castille was heavily favored to win and left no doubt as he went out strong. He passed the halfway mark in 7:11 and had 29 seconds on David Angell. Last year Angell battled John Gardiner for the 5K title but this year the Cal Coast guys stayed on the West Coast. As a result, the men's race for the podium quickly settled out, barring a surprise in the second half of the race. Castille would clearly be the winner; Angell would claim 2nd. He had 11 seconds on his closest pursuer at the halfway point, Jonathan Frieder. The 1-2 spots were claimed with room to spare, Castille claiming the win in a Men's 45-49 record-busting 14:29, and Angell claiming 2nd in 15:37. But the battle for Bronze was where the competition was--who would claim the last spot on the podium? Frieder was going for broke. Running a gutsy, breakout race, Frieder hit the halfway point in 7:51, seven seconds ahead of a chase pack consisting of Kristian Blaich, Carl Combs, Michael Kent, Nat Larson, Kent Lemme, Greg Putnam, and Christopher Shaw, Jr. Eventually Combs and Shaw left the rest of the chase pack behind and started to see if they could reel Frieder in. They were gaining but Frieder held tough, eventually claiming the Bronze Medal by 2 seconds over a hard-closing Combs, with Shaw just a second back. Then it was Kent Lemme, a 5 second gap and then Putnam, Blaich, Larson, Ethan Nedeau, and Kent. It was a great day for racing, some dominant performances, terrifically close races and real gutsy efforts.